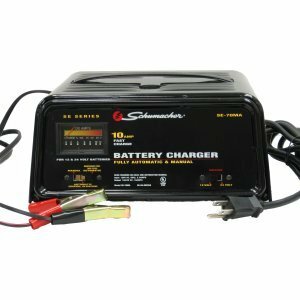 This fully automatic deep-cycle charger is a 12 and 24-volt charger for deep-cycle batteries. Its 10-amps charge a deep-cycle battery in 7-11 hours and an automotive battery in 3-5 hours. It is fully automatic and will not overcharge the batteries. The manual override switch allows users to switch to manual operation for special applications. First of all, a high quality 24V air-cooled charger like this is approx $132+ without S&H. I have Schumacher Chargers and they all operate very well for the price. The weak point on these chargers is "whimpie" wiring that is usually the cause of problems or alleged failures of the unit. If you are not "technically inclined" and have problems, ask a friend or acquaintance who can check the unit. The most common flaw, in my experience, is the connection near the alligator clips, since this area gets the most movement. A continuity check of the wiring can usually locate the fault. Also, since this unit does not have an on/off switch, I simply plug it into a power strip equipped with an on/off switch. A simple fix can save unnecessary replacement of a good unit. In my experience, Schumacher provides a cost effective product considering the price and the service. It works as advertised. Would be more convenient to use if it had an ON-OFF switch. As it is, On and Off are accomplished by plugging it in and unplugging it. I've had the LED type chargers and you really don't know if it's working right or not. With this charger and the analog gauge, you always know what's going on.